We are highly admired by precious consumers for offering best Access Control Services to precious consumers from commercial area. Moreover to this, these presented services are satisfactory and quickly accomplished by sharp minded professionals in easier way. 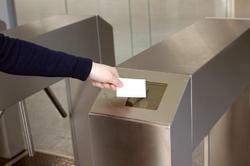 The access control system controls entry/exit from an area/facility and hence forms a security barrier to protect the facilities from unauthorized entries. The restricted access to rooms within the facility results in reduced exposure of Intellectual property and increase in productivity. Authentication, authorization is offered by access control for accessing approval to each content. In most of the cases, the access control offers download control, wipe away the specific user, time-specific access. With MCM authentication of basic user ID and password. - Biometric, face detection, Card system can be get used for attendance and access control. We also provide you the security and safety equipments Suitable for your business needs.